Alcoholics Anonymous is organized into a hierarchy often referred to as an inverted triangle. At the bottom of the triangle are two corporate entities: A.A. World Services Inc. and A.A. Grapevine Inc. North America itself is partitioned into Regions, which in turn are comprised of geographical Areas, which in turn are comprised of Districts, and within each district – at the top of the triangle – are the A.A. groups. Home groups are where the service structure of Alcoholics Anonymous begins. 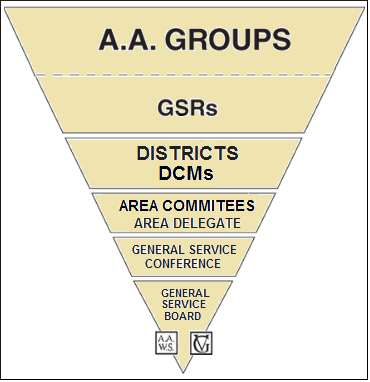 Every registered group in AA should have a General Service Representative (GSR). GSRs are the very foundation of our general service structure. Through your GSR, you can make your home group’s voice heard at district meetings, at area assemblies, and eventually at the General Service Conference. Each home group belongs to a district. District 18/19 is comprised of all meetings throughout Beverly, Danvers, Essex, Gloucester, Hamilton, Ipswich, Magnolia, Manchester, Marblehead, Middleton, Peabody, Rockport, Rowley, Salem, Swampscott, Topsfield, & Wenham. District 18/19 holds a meeting on the second Tuesday of every month at 7:00pm at the Beverly Public Library located at 32 Essex Street in Beverly. All AA members are welcome and encouraged to attend! Districts are grouped together to form Areas. District 18/19 is part of Area 30, which is comprised of all of the districts in Eastern Massachusetts. Area 30 holds five Area Assemblies throughout the year, which are similar to district meetings but on a much larger scale. Every area has a delegate. Similar to a GSR, who brings the group’s ideas beyond the home group, the delegate brings the Area’s ideas to the General Service Conference. Aside from our monthly meetings, there are other ways to get involved at the district level too! Annual District 18/19 Old Timer’s meeting: At the catered event, we have six speakers with at least 25 years of sobriety. We always need help with the planning aspects of the event as well as help the day of including setting up the hall, managing the food distribution, and cleaning up the hall after the event. District 18/19 Thanksgiving Alkathon: The purpose of an alkathon is to provide a safe and healthful environment for persons with a desire to stay sober during the holiday. The district is particularly in need of AA members who are willing to cover the overnight hours between Thanksgiving Eve and Thanksgiving Day. We will also need help planning, setting up, and cleaning up! District 18/19 Annual Roundup: An event which seeks to provide opportunities for those in recovery to come together and share their experience, strength, and hope with each other in a fun atmosphere of fellowship, service, and recovery. We are in need of AA members willing to plan and run workshops, participate in the Traditions Play, set up the facility and clean up at the end of the day. The 2nd Monday of every month at 7:00 pm.